The first class is done! In this class, I just wanted to get the students familiar with the Interface, sculpting basics and a workflow process for sculpting. 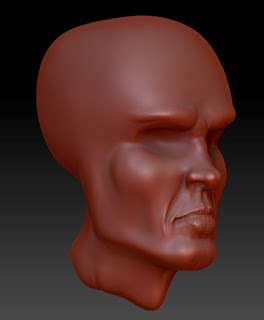 In a way, the work flow is no different then anything we do in 3D - start with the basics, then detail up from there. 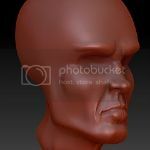 The use of basic sculpting and modification tools is all that is needed to start putting a head (as above - the example I built in class) together quickly. As I told my students, the key here is quickly creating mass and form, smoothing, and then refining the detail as you go. Being able to identify the details (ie. such as the placement of muscles and wrinkles) is part of the creative skills needed to put something together.